Applying 3D printing in medicine has many challenges. First, there are only a handful of materials that can be implanted in the human body. That is, there are only a few materials that can be used in 3D printed implants. Currently, only titanium and PEKK(poly ether ketone ketone) can be 3D printed. However, these materials require a costly printer(USD 1-2.5 million) as well as special approval from the health authorities in Korea. Therefore, the third method of producing implants is currently not feasible. The first and second methods are more practical. In the first method of creating a mold, non-toxic materials can be printed. However, the mold used in 3D printing is not as rigid as the metal mold and this is a major limitation. Even if the right material is found, a temporary implant should be fabricated in the same process described in the second method, which adds an unnecessary step. To avoid this, the mold itself can be 3D printed but in this case, the implant form should be accurately simulated on the computer. This is not feasible as a software sophisticated enough to do such simulation has not been developed yet. Therefore, I have decided that the second method would be the most applicable in clinical practice. I have narrowed down the choice of printers to the following two; 3D Systems’s Projet and Stratasys’s Objet. These printers can use materials that can be allowed in the operation room after sterilization. As the 3D systems’s model passed ISO 109933 and USP Class IV in terms of the build size, resolution and surface finish, it was selected as the best choice. The 3D CT used in large hospitals has far superior resolution compared to the cone beam CT used in private practices. However, specialists with a small private practice cannot afford medical CTs. The Dental CT(cone beam) used as an alternative has limited resolution. I tested the performance of each printer by requesting a 3D print of a CT image to the manufacturers. Most printers were able to produce usable prints. However, this raised the issue of soft tissue noise that is present in the original CT images of the face due to the thin facial bones. Thick bones such as mandibles produced similar image quality as that of a medical CT. I decided to purchase the printer first and work on the software as needed. I had some misgivings about the simulation process before a scheduled surgery. My main concern was the difference between the 3D printed model and the actual bone. I compared measurements of various points and angles of the CT image and actual model and concluded that the margin of error was below 1mm. 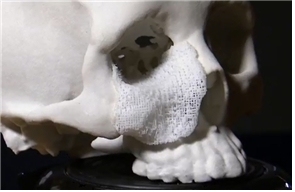 There are three types of materials that can be 3D printed during surgery and placed in the patient. 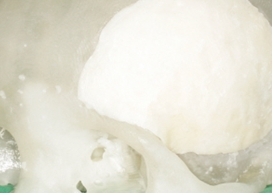 They are PMMA(Poly Methyl Meth Acrylate) also known as bone cement, HA(Hydroxyapatite) and TCP(Trical Cium Phosphate). PMMA is relatively affordable and HA and TCP can guide bone and promote osteoconduction and osteointegration after grafting. However, the cost is very high and the rate of osteoconduction is inconsistent, which means the initial shape is not likely to be maintained. Moreover, PMMA has 90Mpa rigidity, similar to that of human bone, but HA and TCP have rigidity of only about 20~30Mpa and cannot be used in compressed areas. Figure 5. Suitable implant materials. 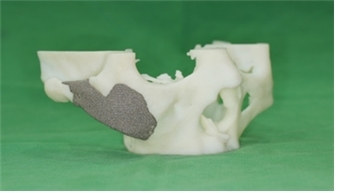 In short, materials that can be 3D printed for medical use are Ti6Al4V Titanium alloy and PEEK with ability for osteointegration as well as a few biodegradable polymers such as PLA(Poly Lactic Acid), PGA(Poly Glycolic Acid), PLLA(Poly L-lactic Acid), and PCL(Poly Capro Lactone). These materials have proven biocompatibility but titanium and PEKK can only be printed by very costly printers of about USD 1 million and USD 2.5 million, respectively. There is lack of long-term data(at least 2-3 years) for biodegradable polymers and they are suitable for only temporary restoration but osteoconduction cannot be expected. Therefore, these polymers may not be suitable as long-term implants. 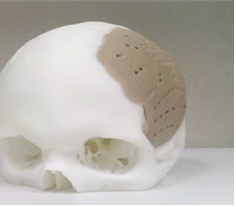 Development of new materials and printing technologies will open new horizons for 3D printing in plastic surgery.